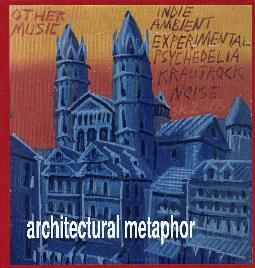 Architectural Metaphor - "Other Music"
This is Arc Met’s fifth official CD release. The band has been around since 1984 and this year is the bands 20th anniversary. A gig in Boston with some of the old members from the 80’s is planned. Anyway, this is a live concert with new drummer, Murph (Ex- Dinosaur Jr.) and recorded in Middletown, CT in 2001. It features some new material as well as old some Hawkwind covers as always! The CD begins with "Overture" from the Strange Daze CD (1998) and goes into a very interesting rendition of "On The Run" by Pink Floyd. "Nuclear Run" is a totally new song that the band started playing back in 2000 and has some quite cool spacey synths and a heavy guitar riff and great playing from Greg. Murph playing drums makes a huge difference to the bands sound. Deb was a totally different kind of drummer. "Aftermath of a Pale House" is a very dreamy mood song with some great guitar by Greg. He is a very underrated space rock guitar player. "The Sabbath Maker", from the Black Widow Records Sci Fi compilation CD, is a heavy song. Due to some technical problems some of the versions of the songs here are not complete, as this one is faded in. Heavy stuff. "Hassan I Sabbah" by Hawkwind is extremely cool. You have for sure never heard a version like this one. The wah guitar is totally over the top! "Kairos", one of my all time favorite songs by the band, is next and an ok version but not the bands best. The CD closes with "Welcome to the Future". Overall, an excellent dose of 90’s space rock! For more information you can visit the Architectural Metaphor web site at: http://www.geocities.com/arcmetgreg.